Drawing is a skill, not a talentif you’ve got a pencil, Mark Kistler will show you how. You Can Draw in 30 Days provides a thorough course in basic drawing, using incredibly quick and simple instructions. In just twenty minutes a day, learn the secrets of sophisticated three-dimensional renderingsstarting with apples and oranges and progressing to landscapes and human figures. Each day focuses on one skill, building toward more advanced technique. 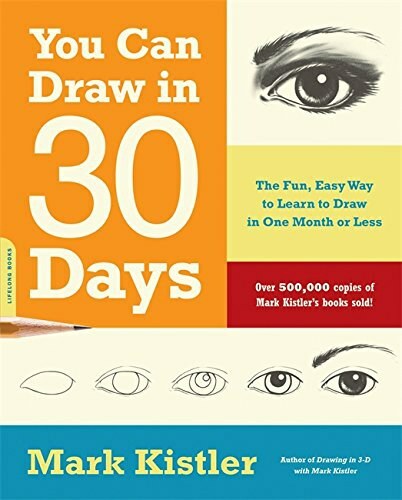 Ideal for students, professionals, or anyone who always wanted to learn but never did, You Can Draw in 30 Days makes it easy to expertly draw everything from the world around you to the vivid pictures from your imagination. exactly is a great book for me to study draw. One professional book. ABCs of Successful Drawing. Attitude, bonus details, and constant practice. 1. Attitude: I can do this positive attitdude 2. Bonus details: Add own unique ideas and observations to your drawing to make it truly your own expression. 3. Constant practice: Repeated daily application of any new learned skill is absolutely necessary fro successful mastery of the skill. ABCs of Successful Drawing. Attitude, bonus details, and constant practice. 2. Bonus details: Add own unique ideas and observations to your drawing to make it truly your own expression. 3. Constant practice: Repeated daily application of any new learned skill is absolutely necessary fro successful mastery of the skill. 3. Size: Draw an object larger to make it appear closer to your eye. sion that it is closer to your eye. sitioned light source, to create the illusion of depth. ject to give it volume and depth. jects in the picture are varying distances from your eye.